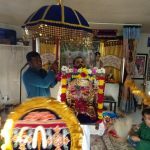 Categories: Bhakti, Divine Names, Guru, Sri Swamiji's Kirtans, Uncategorized. 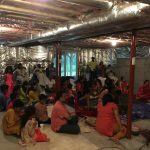 With the immense blessings of Sri Swamiji, Guru Poornima celebrations were held in Frisco, Dallas at the residence of Sri. Mayaji and Mrs.Jayanthiji on the 3rd of July 2012. The satsang commenced at 5pm and the devotees started the celebrations with Dhyana Sloka from Srimad Bhagavatham . 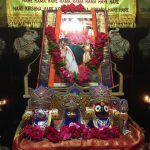 Following this, the enchanting form of Lord Krishna took center stage to enjoy his even more enthralling names being chanted by Dallas devotees. 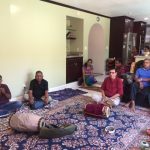 At the conclusion of Nama Sankirtan, Aravindji spoke briefly on the greatness of the Guru with couple of incidents from the life-history of Sri Swamiji. The Gopakuteeram kids then rendered kirtans composed by Sri Swamiji and enacted a short play depicting the great Guru-Shishya Parampara of Bharatha Mata. A few took the role of a disciple [Shishya], such as Swami Vivekananda, Sant Kabir and narrated the greatness of their respective Guru. This lineage of Gurus made everyone realize the never ending grace being showered by God in the form of a Guru. The satsang concluded by singing Kaliyayiyum Bali Kollum and Arathi.